Reality TV star Lisa Vanderpump is well-known on the ”Real Housewives of Beverly Hills" for two things: an affinity to all things pink and a soft spot for animals. Her love for her four-legged companions prompted Vanderpump and her husband Ken Todd to open a dog rescue center in Los Angeles last year. The Vanderpump Dog Rescue Center is a non-profit organization that serves as a rescue and an adoption facility for neglected, abused or mistreated dogs and puppies. The center is one of hundreds nationwide teaming up with NBC and Telemundo stations across the country for the fourth annual Clear the Shelters event on August 18. The pet adoption initiative helps pets in need find loving homes. "Don't buy, don't shop, but adopt," said Vanderpump, adding that these dogs will "enhance your life, they will enrich your life and they will hopefully get all the love they deserve." The center has placed close to 700 dogs in permanent homes since in opened in March 2017. But, the Beverly Grove facility is no conventional dog shelter. The "puppy palace," as Vanderpump calls it, is decorated with pink chandeliers and has velvet couches throughout. Get a taste of the high life, New York style. From a five-star hotel exclusively for dogs to a puppy pool party in the Hamptons, it's clear that NYC really has gone to the dogs! 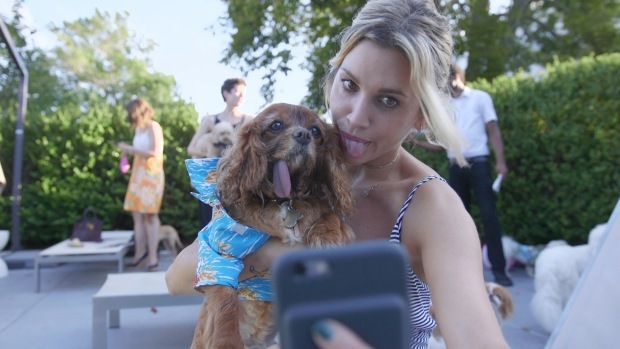 "So what we're going to do is take dogs from the kill shelter, really high-risk dogs and we give them grooming and we have them 'Vanderpuffed,' kind of glam them up," Vanderpump said. In addition to rescue services, the center also offers overnight boarding, grooming services, veterinary work and has a dog café. At the center’s storefront shop, pet owners can buy dog products from the Vanderpump family pillows to the Vanderpump dog clothing line, with all proceeds benefiting the Vanderpump Dog Foundation. "I'm not making any profit. It's all going to the dogs. My life has actually gone to the dogs," Todd quipped. The organization has garnered international attention for its work in trying to end the dg meat trade in China. Vanderpump said she and her husband decided to get involved after seeing images of dogs slaughtered at the annual Yulin Dog Meat Festival in southwest China where people believe the more abuse the dog endures, the better the meat will be. The foundation aims to save four-legged lives by making "a positive impact on global legislation, education and treatment of animals," according to its website. "What is celebrity … if you can't put it to good use? What is the point of being a celebrity? Todd said. The Vanderpump Dog Center located at 8134 West Third St. in Los Angeles. NBC4's Kelcey Henderson contributed to this report.